With the recent release of Halo 4, players have once again been thrust into the space boots of Master Chief Petty Officer John-117. Master Chief has faced a wide variety of enemies since the 2001 release of Halo: Combat Evolved that have been both impressive and terrifying. The mere sight of a particular foe, however, has the ability to chill the blood of even the most seasoned gamer to deep-space temperatures. We are referring to the Inferi redivivus of course, more commonly known as The Flood. According to Robert McLees (artist and writer at Bungie, developer of Halo 1-3) the conceptual origins of the Flood come from the "fungal zombie," an unused asset from the earlier Bungie title: Marathon 2. Upon the release of Halo 3, an entire biological history had been explored, elevating the Flood from creepy space monsters/cannon fodder to a life-form that is truly horrific. It was the knowledge of their insidious life-cycle that led to their destruction at the hands of Master Chief. These space parasites have one mission: survival at all costs. Unfortunately for us, that means the violent death and assimilation of all sentient life in the galaxy. Bummer. These intergalactic parasites reproduce by infecting other sentient organisms of sufficient biomass and assimilating the host cells. This results in monstrous "Flood-forms" of the host, whose physiology is almost unrecognisable, and whose mind has been completely re-wired into serving the parasite's need to consume anything that crosses its path. 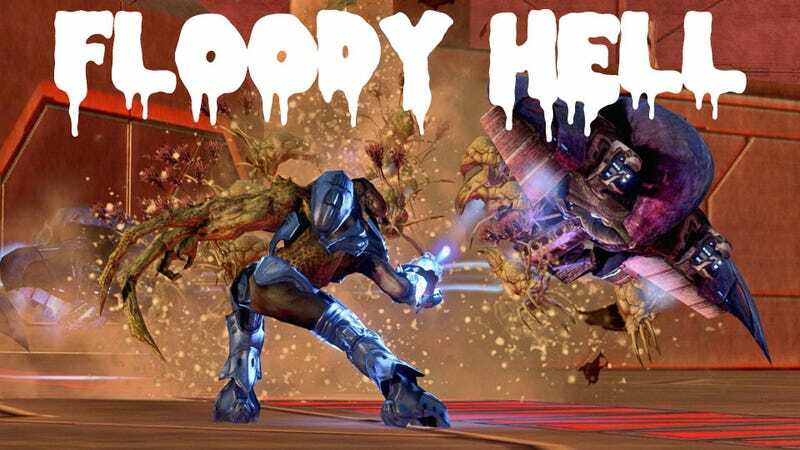 In fact, the Flood were considered so dangerous an adversary in the Halo universe, that entire solar systems have been wiped out in order to hold back the advance of this interplanetary plague. An organic "controlled burn" if you will. Mercifully, such an abomination does not exist in the real world (as far as we know). There are certainly enough creepy flora and fauna on Earth to go around, although currently nothing that amounts to a significant galactic threat. As for earthly parasitic infections, there is an innumerable number of examples; in fact, depending on the definition used, as many as half of all animal species exhibit parasitic behaviour at some stage of their life-cycle. It is clearly a successful biological strategy, as parasites can become so inextricably linked to their hosts that they will coevolve with the host, to such an extent that sometimes the absence of the parasite can lead to autoimmune disorders in the host. Equally, there are some parasites that over long periods of coevolution, develop techniques that alter their host's biology and behaviour even more noticeably. And, dare I say it, just like the Flood! Leucochloridium paradoxum, also known as the Green-banded Broodsac, is a parasitic flatworm that infects snails and birds. To complete its full life cycle, it must infect a snail, then a bird, before infecting another snail. However, the issue here for the parasite (not an issue for the bird or the snail, so much) is that snails are not the preferred food for birds, who prefer caterpillars or grubs. Amazingly, this parasite alters the mind of the snail, making it climb higher to an exposed leaf or branch, rather than skulking around in the undergrowth, increasing the possibility of the snail being picked up by a hungry bird and thus passing the infection to the next host. On top of that, the flatworm is able to change the physiology of the snail, particularly the eyestalks, in order to make them appear more "caterpillar-like," and thus more appetising to a passing bird. This change is due to the caterpillar-coloured "broodsac" (tube-shaped bodies containing parasite larvae) of the flatworm itself, growing within the snail eyestalk (Yikes!). Left: A snail infected with Leucochloridium paradoxum, which has augmented an eyestalk to appear more appetising to passing birds. Right: A member of the Covenant infected with Inferi redivivus, which has augmented the limbs to eviscerate Master Chief more efficiently. So, like the Flood, this parasite has altered the body of its host in order to serve its own ends. This physiological change is obviously not on par with the tentacled monstrosities that appear in the Halo franchise, but is nevertheless significant. There are other parasites though, that are thought to be able to alter the development of its host organism at a molecular level, causing extreme limb malformations. There are several species of the Ribeiroia genus of flatworms that go to extreme (and extremely gross) lengths to increase the likelihood that an infected frog will be eaten by a bird, like a heron, and so pass the infection on to the next host. The flatworm larvae are water-borne, and from rivers and lakes are able to seek out tadpoles and infect them. The resulting frog that develops from the infected tadpole will often exhibit severe growth abnormalities, like extra legs. Left: A frog infected with Ribeiroia, which has caused extra/deformed limbs to increase the likelihood of the host being picked up by passing birds. Right: A human infected with Inferi redivivus, caused extra/deformed limbs to increase the likelihood of the host causing Halo players to cry in terror. How the flatworm larvae are able to cause such extreme effects has still yet to be conclusively determined, although there is evidence to suggest that these deformities are due to the parasite releasing mutagenic/teratogenic chemicals into the developing embryo. Another strategy that is commonly used by parasites of earthly origins, is to modify their physical surroundings to better suit their needs. In the case of the Flood, once an infestation has taken hold, the infected begin to coat their environment in Flood "biomass." This is to aid the spread of the organism by releasing spores. In the real world, there is a parasitic wasp that also effects changes in its environment to increase the surviving potential of its offspring. Hymenoepimecis argyraphaga infects spiders and completely alters the spider's web-building behaviour. Instead of using its web to catch food, the infected spider creates a large web cocoon for the gestating wasp larva, allowing the wasp offspring to hang in position far away from possible predators. So, like the Flood, this parasite has altered the environment around it to protect itself and allow continued spread of the infection. Left: A comparison of i) normal spider web and ii) web of a spider infected by H. argyraphaga, which has resulted in a web cocoon housing the wasp larva, protecting the insect's offspring. Right: A Forerunner ship infested with Flood, which has resulted in a biomass cocoon housing the ship, protecting the infestation. However far these examples are from a bona fide galactic scourge (*phew*), it is still interesting to remember that reality can be as strange, and creepy, as fiction. Just in case though, if you'll excuse me, I'm off to start work on a Halo array to prepare for the pending Ribeiroia invasion. Andrew is a postdoctoral fellow studying trypanosomatids at Queen Mary's University of London and science media consultant for Thwacke Consulting. For more follow Thwacke on Twitter and Facebook! You're running out of ammo, the last medikit you saw was three towns behind, and that nice guy shooting at you just got a sniper to help him out.